The Paris Commune was a revolutionary and socialist government that briefly ruled Paris from 18 March until 28 May 1871. The killing of two French army generals by soldiers of the Commune's National Guard and the refusal of the Commune to accept the authority of the French government led to its harsh suppression by the regular French Army in "La Semaine sanglante" ("The Bloody Week") beginning on 21 May 1871. Debates over the policies and outcome of the Commune had significant influence on the ideas of Karl Marx. The destruction of the Vendôme Column honoring the victories of Napoleon I, topped by a statue of the Emperor, was one of the most prominent civic events during the Commune. It was voted on April 12 by the executive committee of the Commune, which declared that the column was "a monument of barbarism" and a "symbol of brute force and false pride." 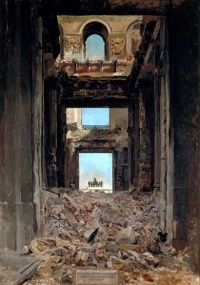 The idea had originally come from the painter Gustave Courbet, who had written to the Government of National Defense, on 4 September, calling for the demolition of the column. In October, he had called for a new column, made of melted-down German cannons, "the column of peoples, the column of Germany and France, forever federated." Courbet was elected to the Council of the Commune on April 16, after the decision to tear down the column had already been made. The ceremonial destruction took place on May 16. In the presence of two battalions of the National Guard and the leaders of the Commune, a band played the Marseillaise and the Chant du Départ. The first effort to pull down the column failed, but at 5:30 in the afternoon the column broke from its base and shattered into three pieces. The pedestal was draped with red flags, and pieces of the statue were taken to be melted down and made into coins. Once the fighting began inside Paris, the strong neighborhood loyalties that had been an advantage of the Commune became something of a disadvantage: instead of an overall planned defence, each "quartier" fought desperately for its survival, and each was overcome in turn. The webs of narrow streets that made entire districts nearly impregnable in earlier Parisian revolutions had in the center been replaced by wide boulevards during Haussmann's renovation of Paris. The Versailles forces enjoyed a centralized command and had superior numbers. They had learned the tactics of street fighting and simply tunnelled through the walls of houses to outflank the Communards' barricades. French writers and artists had strong views about the Commune. Gustave Courbet was the most prominent artist to take part in the Commune, and was an enthusiastic participant and supporter, though he criticised the Commune’s executions of suspected enemies. (See above). On the other side, the young Anatole France described the Communards as “A committee of assassins, a band of hooligans [fripouillards], a government of crime and madness.” the diarist Edmond de Goncourt, wrote, three days after La Semaine Sanglante, "...the bleeding has been done thoroughly, and a bleeding like that, by killing the rebellious part of a population, postpones the next revolution... The old society has twenty years of peace before it..."
Victor Hugo was critical of the Commune but sympathetic to the Communards. At the beginning of April, he moved to Brussels to take care of the family of his son, who had just died. On April 9, he wrote, “In short, this Commune is as idiotic as the National Assembly is ferocious. From both sides, folly.” He wrote poems criticising both the government and the Commune’s policy of taking hostages for reprisals, and condemning the destruction of the Vendôme Column. On May 25, during the The Bloody Week, he wrote: “A monstrous act; they’ve set fire to Paris. They’ve been searching for firemen as far away as Brussels.” But after the repression, he offered to give sanctuary to members of the Commune, which, he said, “was barely elected, and of which I never approved.” He became the most vocal advocate of an amnesty for the Communards who had been exiled, which was finally granted in the 1880s. Among the first litterateur who wrote in favor of the Commune is Victor Hugo whose poem "Sur une barricade", written on June 11, 1871 and published in 1872 in a collection of poems under the name "L' Année terrible," honors the bravery of a twelve-year-old communard being led to the execution squad. As well as innumerable novels (mainly in French), at least three plays have been set in the Commune: Nederlaget by Nordahl Grieg, Die Tage der Commune by Bertolt Brecht, and Le Printemps 71 by Arthur Adamov. Historian Albert Boime states that that several right-wing popular novelists of the 19th century depicted the Commune as a tyranny "against which Anglo-Americans and their aristocratic French allies heroically pitted themselves". Among the most well-known of these anti-Commune novels are Woman of the Commune (1895, AKA A Girl of the Commune) by G. A. Henty and in the same year, The Red Republic: A Romance of the Commune by Robert W. Chambers. There have been numerous films set in the Commune. Particularly notable is La Commune (Paris, 1871), which runs for 5¾ hours and was directed by Peter Watkins. It was made in Montmartre in 2000, and as with most of Watkins' other films it uses ordinary people instead of actors in order to create a documentary effect. The New Babylon (1929) was the recipient of Dmitri Shostakovich's first film score. The Italian composer, Luigi Nono, also wrote an opera Al gran sole carico d'amore (In the Bright Sunshine, Heavy with Love) that is based on the Paris Commune. The discovery of a body from the Paris Commune buried in the Opera led Gaston Leroux to write the tale of Le Fantôme de l'Opéra. The title character of Karen Blixen's Babette's Feast was a Communard and political refugee, forced to flee France after her husband and sons were killed. Soviet filmmakers Grigori Kozintsev and Leonid Trauberg wrote and directed in 1929 the silent film The New Babylon (Novyy Vavilon) about the Paris Commune. Terry Pratchett's Night Watch features a storyline based on the Paris Commune, in which a huge part of a city is slowly put behind barricades, at which point a brief civil war ensues. The rise and fall of the Paris Commune was depicted in the novel Spangle by Gary Jennings. French writer Jean Vautrin's Le Cri du Peuple deals with the rise and fall of the Commune. This 1999 Prix Goncourt winning novel `Le Cri du Peuple' is an account of the tumultuous events of 1871 told in free indirect style from the points of view of a policeman and a communard tied together by the murder of a child and love for an Italian woman called Miss.Pecci.The novel begins with the discovery of the corpse of a woman dumped in the Seine and the subsequent investigation in which the two main protagonists Grondin and Tarpagnan are involved. The eponymous `Le Cri du Peuple' is a communard newspaper edited by a man called Valles. The book itself is supposedly his account. The painter Gustave Courbet also makes an appearance. Comics artist Jacques Tardi translated the novel into a comic, which is also called Le Cri du Peuple. In Fire on the Mountain by the American author Terry Bisson, African Americans began a slave rebellion throughout the south after John Brown's successful raid on Harpers Ferry. In the novel, the Paris Commune was one of many successful socialist states. In the long-running British TV series The Onedin Line (episode 27, screened 10 December 1972), shipowner James Onedin is lured into the Commune in pursuit of a commercial debt, and is trapped in heavy fire. Unless indicated otherwise, the text in this article is either based on Wikipedia article "Paris Commune" or another language Wikipedia page thereof used under the terms of the GNU Free Documentation License; or on original research by Jahsonic and friends. See Art and Popular Culture's copyright notice. This page was last modified 06:48, 17 July 2014.